In conjunction with the exhibition Nicolas Moufarrege: Recognize My Sign, Musiqa presents a special concert inspired by his embroidered paintings. Please RSVP to this free concert here. To guarantee your seat you must arrive at least ten minutes early. If you have questions please contact fcleveland@camh.org. Winner of the 2013 and 2016 Chamber Music America/ASCAP Adventurous Programming Award, Musiqa is a non-profit organization dedicated to the performance of contemporary classical music. 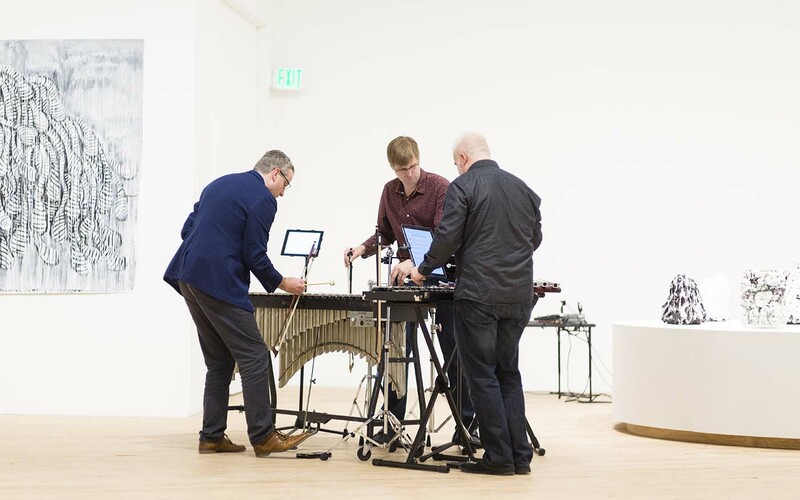 Founded in 2002 and led by four composers, Musiqa aims to enrich and inspire the community through programs that integrate contemporary music with other modern art forms. Musiqa celebrates modern creative arts through interdisciplinary concerts that highlight modern music and its connections to literature, film, dance, art, and more. With its innovative collaborations and educational programming, Musiqa strives to make modern repertoire accessible and vital to audiences of all ages and musical backgrounds.